it’s official folks. we have triangulation now. approaching war with Iran all but begun. this is the plan and it is diabolical. many summers ago, when i was young and determined to pursue the earth sciences as a career, i took a part time job on a sheep ranch near Baker CIty Oregon. it was a real pretty place located near the Eagle Cap Wilderness. I had a small trailer and needed a place to park it for the summer while i worked as a “cheap” not chief geologist for a drill crew. the sheep rancher needed somebody to watch his herd of thousands of hoofed locusts on sundays. fool that i was i told him i had worked with sheep how hard could it be? that i had worked with sheep dogs how hard could that be? and- the clincher that i could ride a horse. well, an old plug that he called rusty. first the sheep started for the fence the rancher had warned me about- the one adjoining BLM land where they could pretty much wander off toward the snake river country into oblivion. I couldn’t make the horse do much more than just stand there and try to bite me. the dogs looked at me for direction for a few minutes while i gesticulated wildly screaming at the sheep and trying to head them off- too late. the lead sheep had already sprung free and they spilled immensely away. once the dogs saw that i was completely baffled they lay flat on the ground and whined. someone had told me that to get sheep to move where you want them you have to position the dogs. the hand signal for this was a tiny gesture that could be mistaken for almost any motion of the hand and i tried all of them- the mistaken ones. finally, i quit running around and just sat down on a low hill overlooking the escaping two hundred acre wool blanket with legs. eventually, they calmed down and began chewing the grass. 5000 plus mouths pulling plants up practically by the roots and chewing- i lay down and felt the vibration of all those hungry teeth working on anything green. meanwhile the dogs grew bored of me and wandered off behind the sheep- perfectly positioned to prevent them from escaping into the next drainage, while i slept. they lay on their bellies and watched the flock. i was completely irrelevant to everything and the best thing i could do was lay still. when i did stand up or move my arms the sheep would look at me poised with uprooted plants dangling and start to bleat piteously and mill about. any slight movement on my part could send them over the ridge and miles away from sanctuary. the point of all this is that some politicians are sheep dogs. they relax the flock and allow them (the economy) to eat and grow. some politicians are like me- kind of ignorant and skittish. maybe a little too unsure of themselves so they just cause panic. 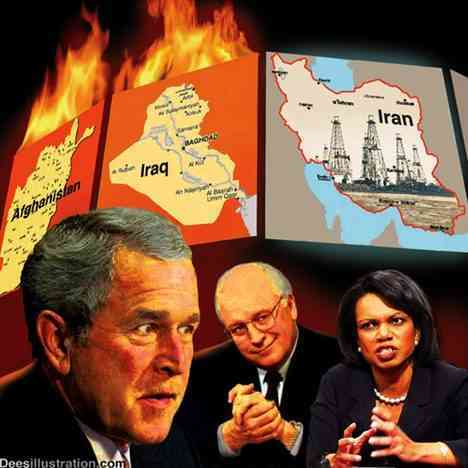 Bush and Cheney have pulled out the fear card before and they know how to panic the flock. that is how they roll. and it works- if what you want is oblivion, that is. big money talks they don’t do what?? ?